Los Angeles–based artist Soo Kim’s works Midnight Reykjavik 12 (pictured above) and (very softly) are in the current exhibition Decisive Moments: Photographs from the Collection of Cherye R. and James F. Pierce. 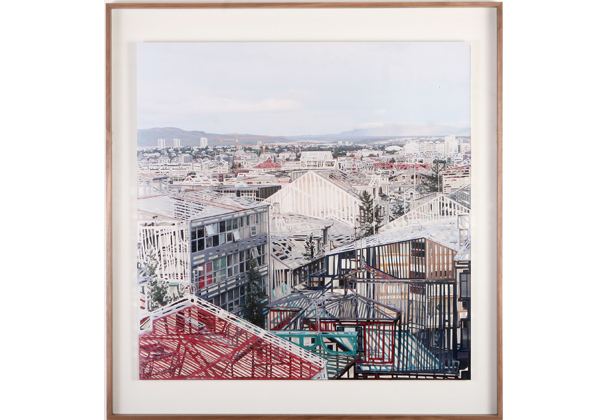 The first is an intriguing scene of the Icelandic capital with pieces cut away from the photograph, the second an almost abstract construction set against an image of tree branches. She will talk about her work and process at the Honolulu Museum of Art Doris Duke Theatre on Monday, March 24 at 7pm. Kim, who is also a professor and program director of photography at Otis College of Art and Design, took time out of her busy schedule to answer a few questions for us by email. How did you arrive at your technique of cutting away areas of your photographs of built environments? My practice as an artist centers on the subtraction of visual information from the picture plane through the techniques of cutting and layering photographic prints, and introducing areas of absence or disruption. I attempt to address issues of photographic transparency, ubiquity, and the rapid consumption of images throughout my practice. Through these cuts and subtractions, I hope to create a “slowness” in the reading and understanding of an image that makes evident the materiality of the medium as well as the time of labor and deliberation, marked by imperfection, that works against the speed and perfection of developing technologies. I studied art throughout my undergraduate and graduate studies, but not specifically photography. For example, CalArts’ School of Art is divided between art, graphic design and photography, and I was a student in the art program, not photography. Because I didn’t study photography specifically, I think it helped me approach photography differently. I wasn’t taught early on to take the precautions of handling photographic materials that is usually taught, so it didn’t feel so unnatural to handle and orient my practice in a material and physical way. I really started making photographs during the last few months of graduate school, and it was really exciting to work with photography for all its indexicality, and its generosity. Increasingly, I wanted to make photographs that dealt with the confusion of subjectivity and objectivity, its stubborn indexicality, as well as the generosity and reservation I found the medium to be able to carry. I see the excision of photographic material from the picture plane as a subtractive method that lets me insert a range of different information with each body of work I make. How do you decide what you’re going to slice away, and is that intellectually significant or is it purely an aesthetic choice? Each body of work starts with an idea that sometimes deals with seeing, photography, representation. I have in mind a structure, or system, for what information gets removed from each photograph that makes up a body of work, but that could change over the course of the making of the series. I don’t use rulers, or assistants, and I don’t adhere to a system that is absolute. I learn while I make the work, and I consider my practice mistake-driven. The mistakes I make often lead me to new ideas. You are based in Los Angeles, yet your photographs indicate that you travel a lot—Reykjavík , Dubrovnik, Seoul. How do you choose places to photograph? Most of the cities I photograph are selected by the ideas I am working out through my photographs: Reykjavík because I was looking for a capital city that was located in an area to experience the midnight sun; Arcosanti for its history and connection to the seminal book documenting its early years; Seoul for a cemetery that I had visited very regularly to talk about camouflage, war, life. I am often drawn to places that have divided and vested political interests: Cyprus, Taiwan, Korea. These locations are the means by which I can articulate broader themes and arcs within my practice as an artist. What equipment do you use to take your photographs? Until very recently, all of my work was made with film cameras, large- or medium-format cameras. For the last few bodies of work, I have used a DSLR, a Nikon D800 to be exact, to make the work. A blurb about your work on the J. Paul Getty Museum website says that your Midnight Reykjavík series “was influenced in part by architects’ writings from the 1960s on utopian communities.” Can you elaborate on that? I’m interested in ideas of the utopic city and Midnight Reykjavík grew out of researching and looking at architectural ideas borne in the 1960s that envisioned the future city as dynamic and flexible, (the work of Superstudio, Archigram, Situationist International, Constant, to name a few) and I wanted to make an image of a city that highlights urban experience as being an indeterminate one both physically and psychologically. In both cases the focal point of the work is not what you can see, but instead what the viewer can add to the scene suggested by the absence, collision, and fantastic reconstruction given by the photograph. In 2012, I made an outsized, limited-editioned book entitled In Light of the Moment, which took as its subject the utopic community of Paolo Soleri’s Arcosanti in Arizona. My book was inspired by Soleri’s book about Arcosanti, which was made at the very beginning of his project. My book shows the site as it stands 40+ years later. When I look at Midnight Reykjavík 12, which is in Decisive Moments, it makes me see how much there is behind building facades. We see a smooth exterior of house after house normally, but in your work I think of how much goes into making each house, and all the busy lives within them once completed. What were you expressing in Midnight Rekjavik 12? In making the work, I was interested in using photography to depict differently what we might understand from seeing a photograph: the photographs were shot at midnight on the summer solstice, but it looks like it was shot at noon except for the subtle cues such as the absence of people; two photographs make up each piece, collapsing opposite panoramic views within one view; the series makes up a panorama of a city, but a humanistic view where horizons rise and drop rather than a complete but mechanistic panoramic view. I wanted to bring in a collage effect where the cut-out wall in a front photograph would reveal a tree in the back photograph, showing the landscape as dynamic, unstable, shifting, and unpredictable. The photographs were made in 2005, and finished in 2007. During this time, Iceland, and the world, experienced a global economic crash with the housing market becoming iconic of that crash. This body of work, in hindsight, also speaks not just of the city and of ideas of home and community, but can also be considered as a picture of this economic crisis, of the housing market where the stability of home as idea and investment underwent a radical shift and alteration, and Reykjavík as an early and prime example and location of those events. Do you have a relationship with Jim and Cherye Pierce? Can you talk a little bit about developing relationships with collectors? Is it sort of like being a birth mother and having a relationship with the adoptive parents of your child? I met Jim and Cherye Pierce at Angles Gallery in Los Angeles, and immediately liked them very much. I’ve met a lot of collectors and Jim and Cherye were not just informed and engaged collectors, they seemed to have a passion for the work they acquired, a care for the work in their collection. They were interested in a body of work that was sold out and I made one last piece, entitled (very softly), expressly for them. I have been making work for 20 years or so, and have been fortunate to have met a lot of collectors. I learn a lot from them, and one of the reasons I make my work site-sensitive through the specific framing I developed is because of the relationships I’ve made with collectors. Each of my works is unique and considers the site/wall it hangs on because that is the relationship I want to build, or at least make available, with the collector or institution that acquires my work. Because of the way my work is framed, if a collector hangs the work on a blue wall, for example, it will read very differently because the blues in the photograph will blend in with the wall. Their wall will serve as the border around the photograph, framing it specifically to their place. I suppose because of this conversation I’ve built into my work, I don’t have that yearning to keep all my work to myself. My work is completed when it lives in the world, changing with each place it hangs. You are one of the artists in Decisive Moments that shows photography can be more than a 2D art, with your work moving into the sculptural realm. What kinds of developments do you foresee for photography in the future? I came to photography through reading Walter Benjamin, and his ideas still resonate with me. I think photography will change and develop through ideas about photography as much as the apparatuses that let those ideas become manifest. New technological advances in photography don’t necessarily make work more interesting for me. A lot of artists are using scanners as cameras, processing systems, continuing material investigations, etc.—all of that is quite interesting in thinking about how we understand photographic imagery, information, ubiquity and distribution, and those works along with more traditional practices and ideas by thinkers like Flusser and Rancière, will together shape the development of photography. There is another artist named Soo Kim, but based in New York. Do you receive correspondence aimed at her and vice versa? There’s been no overlap between myself and that Soo Kim. Though she is my internet search nemesis!